In an effort to reduce environmental strain due to overpopulation in the Calico Mountains of Nevada, the Bureau of Land Management is rounding up thousands of wild horses for relocation. Currently there are over 3,000 wild horses and burros roaming the 542,100 acre Calico Mountains Complex. Extreme drought in the region has resulted in inadequate water and grazing for the horses and other local wildlife. According to a BLM press release, the roundup will remove the majority of the population, leaving a more sustainable population of 600-900 mustangs in the complex. The BLM will also use fertility control in the mares they release back to the Complex after the roundup. The horses collected by the BLM will be given veterinary care, then offered for adoption. Those that are not adopted will be sent to large Midwestern ranches used by the BLM as long-term holding for wild horses and burros. Wild horse advocates attempted to halt the roundup by bringing the case to court, asking the court to block the roundup on the basis that it violated federal law. The judge sided with the BLM, however, and allowed the roundup to continue after the December 23 ruling. In response, opponents of the roundup, including actor Viggo Mortensen and singer Sheryl Crow, appealed to Senate Majority Leader Harry Reid of Nevada and President Obama, asking them to intervene and halt the roundup. In response, Sen. Reid expressed dissatisfaction with the BLM’s past management of the horses. However, he acknowledged that at this time the roundup is necessary, but cited past mismanagement of the herds as a major factor in the current situation. The BLM really needs to get a better grasp on the situation since they are destroying the bloodlines and diversity of our wild mustangs and they don’t seem to care. You are definiely right Katie. Thank God they have mustang sanctuaries that help preserve rare bloodlines. If they didn’t, these rare mustangs would probably be extinct. Also, all the other non-rare mustangs might end up in an auction with other poor horses where killer buyers will just grab them up. It’s so sad and I’m glad even celebrities aree trying to help. Oh, grrrr. Thanks so much for letting us know. When I read about a winter round up, I was very upset. A few years ago I agreed with the BLM on keeping the population down, as to help the herds from starvation. But now a days, they are leaving too few mustangs on the range. They can have their round ups if they only take what would otherwise be mountain lion food and they keep them in the warmer weather. Please watch the Cloud: Wild Mustang series. Wild Mustangs are just that – WILD! The methods used to gather these animals terrify them and are, in my opinion, crueler that leaving them alone. In the wild, it is survival of the fittest. Leave them alone !!!! If there is insufficient food or water, they will move to areas that have more or will die a natural death. We cannot save them all and there are not enough homes for the domesticated horses as evidenced by the number of rescues that are overwhelmed with the numbers of abused and abandoned horses. At least these animals are born to survive just where they are. Another example of the government trying to “fix” something that isn’t broken. As much as I agree with the supportive posts, the only people who can make our wild horses safe are on Capitol Hill, especially in the Senate. 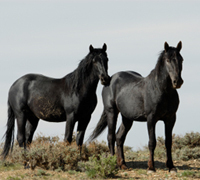 The Restore Our American Mustangs (ROAM) Act remains stalled in the Senate’s Energy and Natural Resources Committee, and Senate committees are the graveyards of countless fine bills and worthy causes. As I understand the record, Senator Robert Byrd (blessings upon him!) is the sole sponsor of the Senate version of the bill (S. 1579). Who knows how long he will be able to hold on and champion our cause? We need to find another powerful Senator to lead the charge. Any suggestions? The money and time spent on rounding up the wild horses of Nevada is being wasted. that the horses do not cross busy roads or enter personal property in search of water. into ways to control the size of herds (birth control/sterilizing) and redirecting their grazing areas. BLM has coined the phrase “America’s Living Legends” in describing our wild horses but they do not show much respect for these beautiful animals. There used to be 1000s if not millions of horses roaming. I don’t see how 3000 horses on 5.5 million acres would drastically upset the balance of things. I agree with those below who suggest using the money, not for relocation, but for watering and sustaining the population. And if some die from overgrazing or starvation, that is natural. I think most them would prefer that to living the rest of their lives in fear and/or in corrals. I see nothing wrong in adopting some out to good homes but most will not end up this way. every other animal in that area is manages wether it be tags issued, or natural predators. the wild horses however are not. the calico complex is crawiling with horses. the horses u see in the videos and on the news are the healthiest and best looking of the area. some suffer from genetic conditions from inbreeding such as cleft pallets or deformed spines. theses horses either starve to death or need to be humainly euthinized if found. and of course as they said lack of water and feed. did u know that the ansestors of todays nevada mustangs… like horses 50 yrs ago were all privatly owned by ranches? 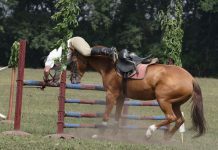 did u know that half the heard was use for saddle horses the other half for human comsumption? and did u also know that during world war II soldiers survived on horse meat produced in northern nv and ca? as long as the horses arn’t being wasted… really what is wrong with slaughter? thats a whole nother argument though. topic at hand: too many horses.. populations need controlled! ROUND EM’ UP! Beef cattle effectively control 98% of land the wild horses and burros were given by law and still rightfully should control. Grazing leases exist on 75% of all herd areas. The herds are, by law, supposed to be managed as the principal presence in their herd areas. The Bureau of Land Management is mismanaging the wild and horses and burros to extinction. 21 million acres of wild horse range has been zeroed out illegally by the United States Government. Taxpayers money is being wasted, the wild horses and burros are losing their homes, family groups and their health, and will be sterilized and maintained with no future reproduced by our government. Congress nor the Bureau of Land Management has the backbone to do anything about it. What needs to happen is the Bureau of Land Management needs to be removed from the wild horse and burro business. Interior Secretary Salazar also needs to be removed from the wild horse and burro business. A heritage species requires more thoughtful protection on its own ranges. The horses on the ranges are not costing the American public any money. It is the horses’ roundups (millions of dollars per roundup) and their mishandling by the United States Government that is costing the $$. It is the 200 to 1 ratio cows to wild horses and burros that is costing the range degradation. BLM Bungling Land Management! The cattle overgrazed the land, yet they are still there. I couldn’t agree more with Flora, Sentry ID. Flora from Sentry, ID has it right! This article does not–wss it written by the BLM’s spin department? This article does not tell the truth about the round-ups. The horses are driven miles over hard terrain–by helicopter wranglers. They are penned without shelter–and the “citizen watchers” are not allowed to see them and monitor their condition. Over 100 adult horses have died– and 40 mares aborted due to the stress of the drives. Shame on BLM. Get the cattle off the horse lands. Leave the horses free–1971 Wild Horse and Burro Act. Inhumane treatment of publicly owned horses. Why don’t they reduce the number of cows being grazed instead of secretly running these horses to their deaths. But we all know lobbyist rule Washington. These horses settled the land before we did, its like the indians except the mustangs dont have a voice!!! We should not take them from their homes! the people in washington or the BLM dont know how the horses survive or how hardy they are!!! Nature has ways of working things out without the interfence of man. Let the horses be!!!!!!!!!! I have a degree in Equine Science & am currently Majoring in Envirmental science & this is what I have been learning tons about with this subject as it all ties into the same subject of global climate change & warming. The area of land in which the animals once were able to roam freely has been greatly reduced by inhabitants of man, civilization has greatly reduced the substainability of the land & it’s ecosystems taking away their ability to support large herds of grazing animals such as equines like horses & burros. No one wants to take the animals away from there native home, but in order to restore & maintain the native ground in which these animals need to survive their numbers really do have to be reduced. As long as this is being done ethically & still left within a substainable balance, it should not harm the natural survival of the animals. They could be gotten rid of in more non humane ways but they are not & it is helping & saving them by finding a new home to relocate them and let them spread out more, so that they’re beauty can flourish and not be deminished by their ability to over populate, inbreed and become more of a hazard like white tailed deer then an enjoyment. I do not support the irratic use of man made vehicles to round these animals up,but I do support it’s every outcoming intentions, which is to not only manage the herds but to substain the beauty of our native lands and their small percentage left. In my opinion, the BLM just need to leave them alone! I agree that they need to lower the prices when auctioning them. Someone who knows a lot about Mustangs told me that after the auctions, instead of releasing them back into the wild would send them to slaughter! And seriously, why do they need to scare them with helicopters? That is cruel in my opinion, making the horses run over rough terrain for miles in the hot sun. I read that sometimes the foals hooves will split in two because of that. I watched the videos at http://www.thecloudfoundation.org and I was shocked to see the round ups! Let the beautiful, wild Mustangs remain wild!